If you've been an avid reader of my foodie adventures, you'll know how much I enjoyed every Zomato Foodie Meet-up I've ever been to. This time, Zomato goes on full blast and invited their foodie members in their very first Zomato Food Crawl at Solaire Resorts and Casino. 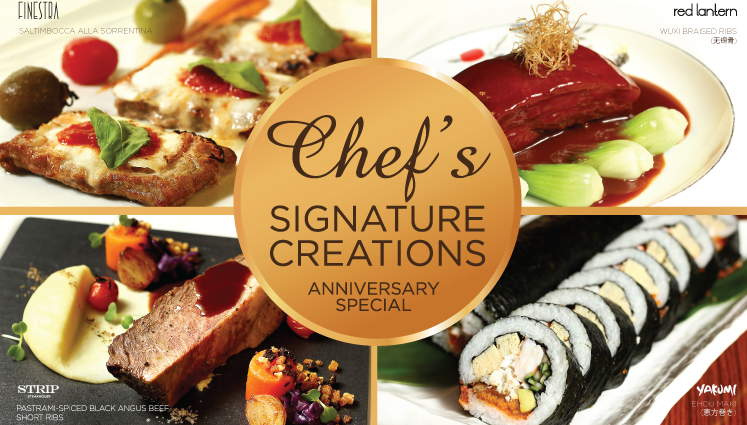 As a teaser, we were informed that we will be trying 6 different restaurants at Solaire Resort and Casino.We'll try what each restaurant specially prepared for Solaire's Anniversary. With that, I grew excited! 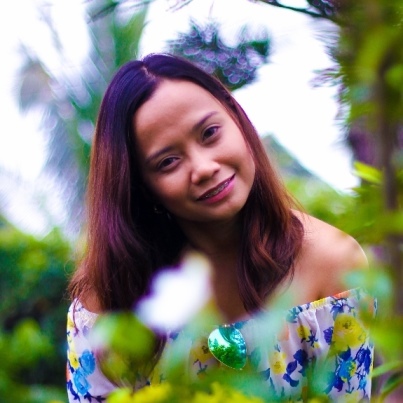 I've been to Solaire when they opened Oasis Garden Cafe and Waterside Restobar at the newly opened Sky Tower, so most likely I had an idea that those two will be included. Solaire Resorts and Casino boasts a few hectares of gaming and entertainment complex, complete with all facilities that will make it an enjoyable stay. 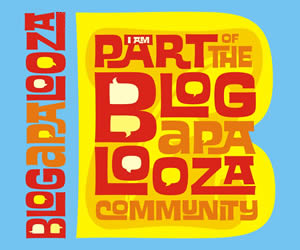 From their extensive casinos, luxurious hotel accomodations and a good variety of restaurants to try. As I make my way through the Sky Tower, I was able to pass by some good and pretty restaurants, my tummy was already doing somersaults with excitement! 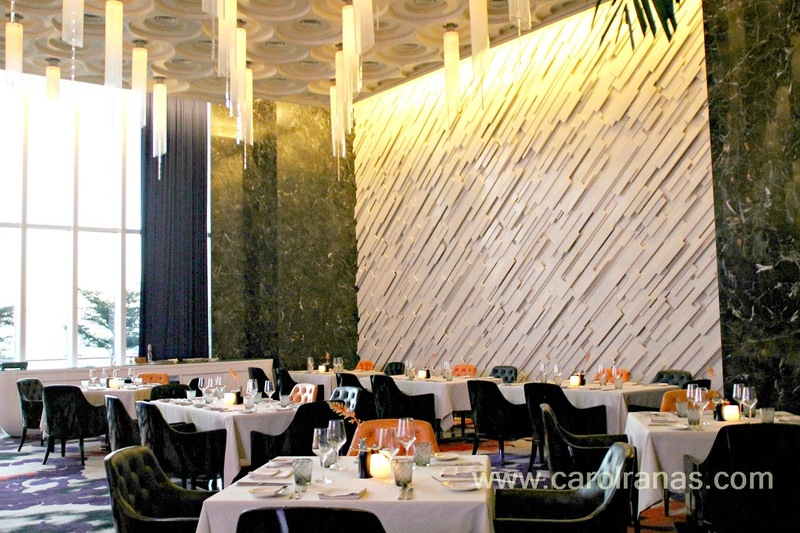 Finestra is a fine dining authentic Italian restaurant at Solaire Resort and Casino. Their interiors are classy and impressive. The floor to ceiling windows brings more light and a great view of Solaire's pool area and Manila Bay. 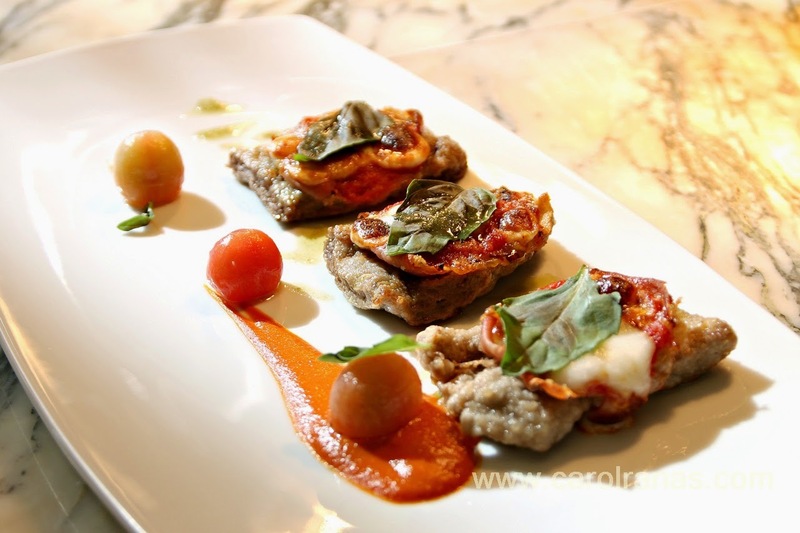 For Solaire's Anniversary, we were able to try Finestra's Saltimbocca Alla Sorrentina. Their Saltimbocca Alla Sorrentina, which was braised veal, speck ham, buffallo mozarella and San Marzano tomatoes. It was delicious! It was my first time trying veal, it also has the same texture as a medium rare beef tenderloin. I didn't even realize that it was veal. As I've mentioned, I've been to their opening night, so I have an idea of what they would serve. I was excited because I was sure that my favorite set, the Surf and Turf will be there, and I was not wrong! 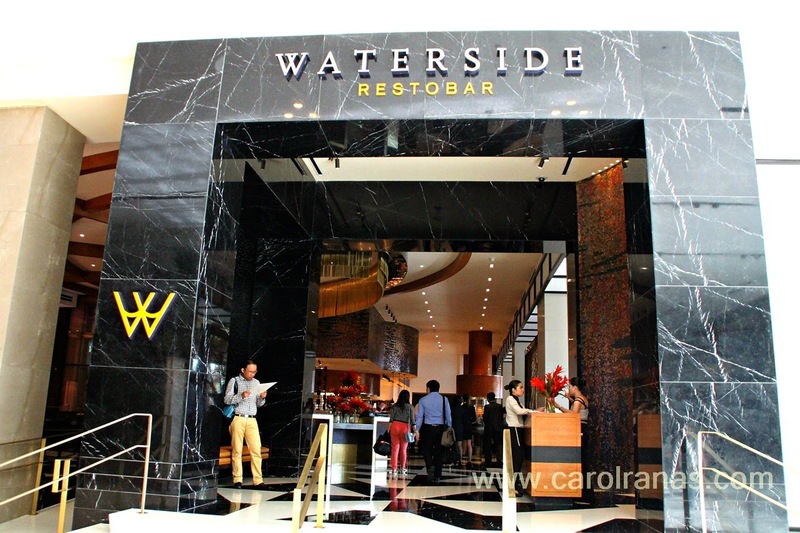 Waterside doesn't skimp and my second time trying it, they really aim to please each diner's tummy. 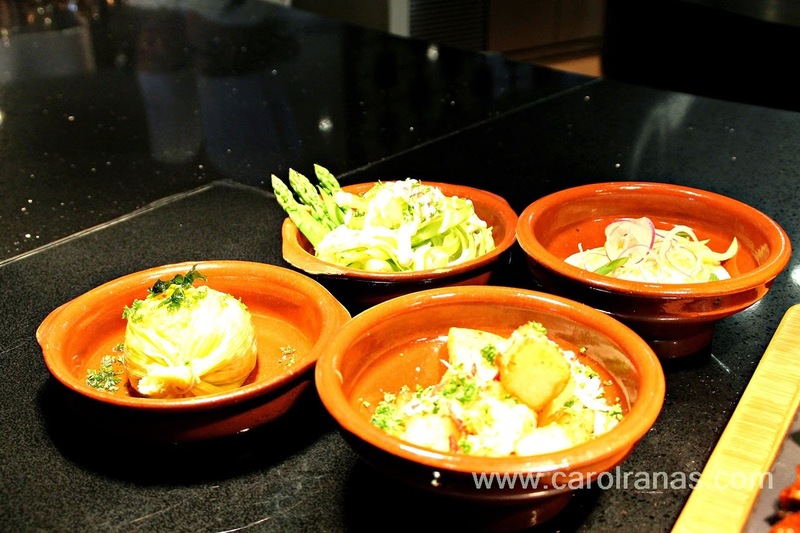 We were served their famous Paella Valenciana in those cute petite pots, and my favorite Surf and Turf set. The set is a bit different than what I preciously tried, it was less overwhelming. 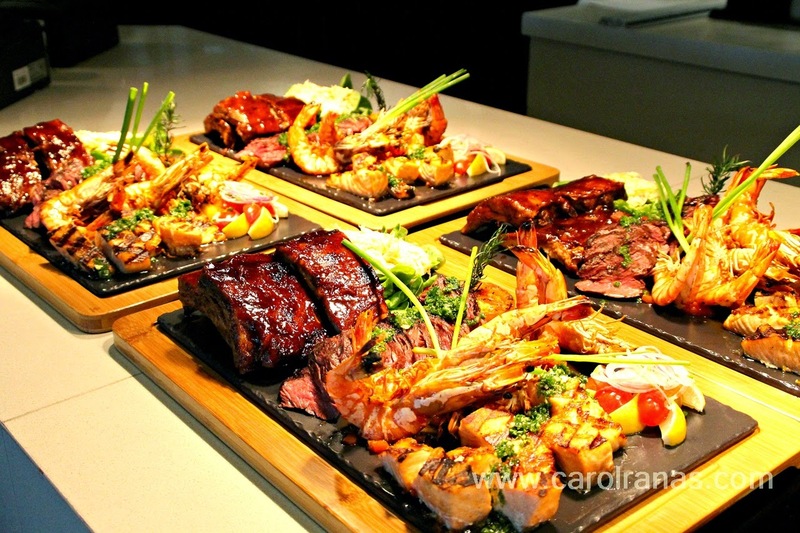 It include slices of Hanger steak, Pork Ribs, Prawns and Salmon. It was a perfect balance of meats. They also served us different types of sides like Humita, Potato Carbonara, Aparagus and Zucchiini Salad and Mango Salad as well. Waterside was just the second stop for the food crawl, yet we were almost full. 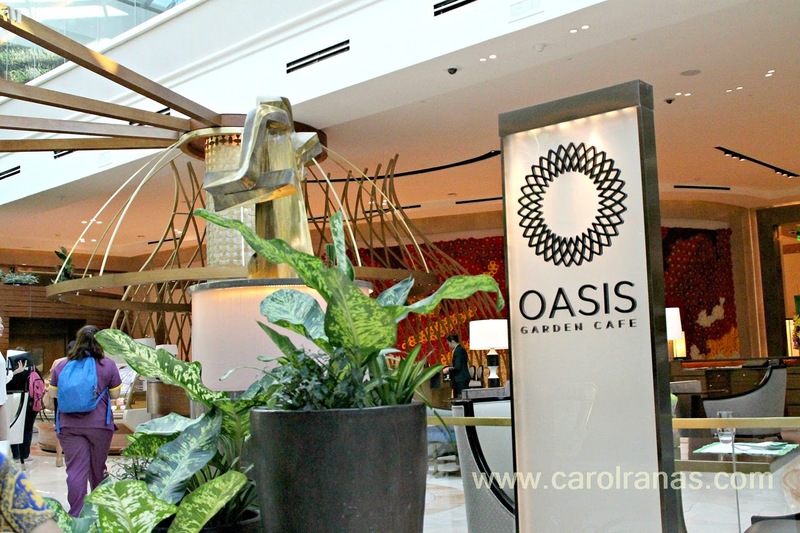 Oasis Garden Cafe is an open garden cafe right in the center of Sky Tower. this cafe is aesthetically pretty and calming. 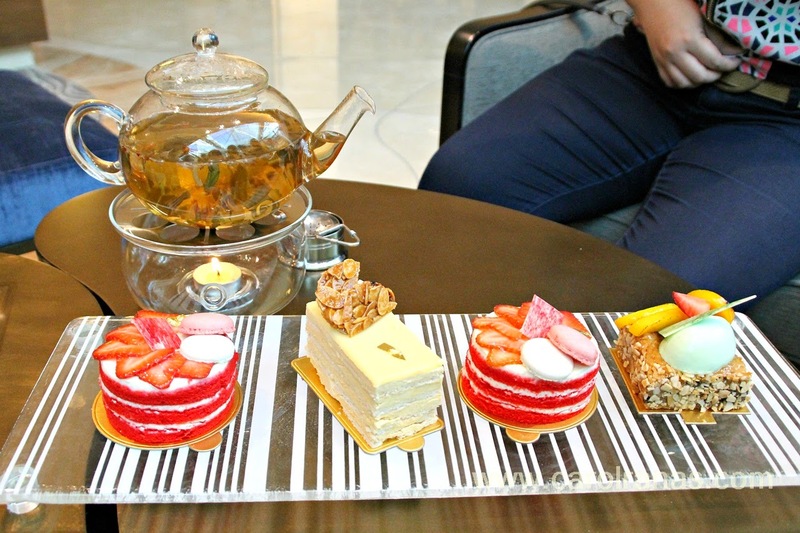 They let us try their exquisite teas and some of their new cakes. These are the newest cakes that Oasis Cafe has to offer. 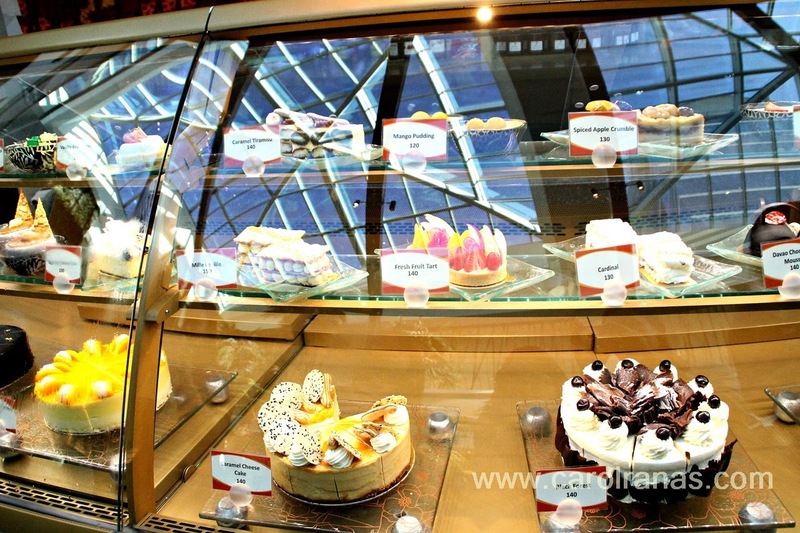 All of their cakes are visually appetizing and delicious. And you won't believe that these intricate and handcrafted cakes are just the same prize as those cakes you order at Starbucks! The last three stops are conveniently located at the bayside, which gives diners a spectacular view of the sunset. We were able to catch the sunset that time and it was awesome! They rarely offer al-fresco seats by the bay because of the situation (specifically odor) of Manila Bay, which I nodly agreed. 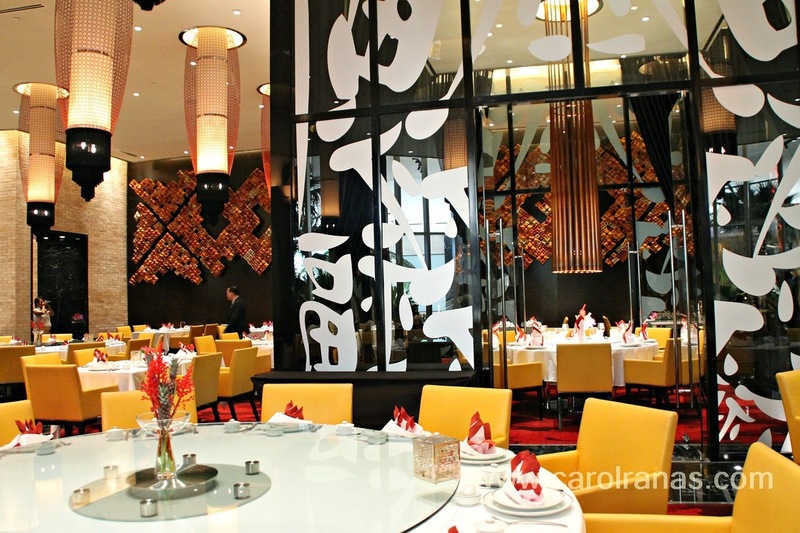 Red Lantern offers exquisite chinese cuisine in a formal dining set-up. 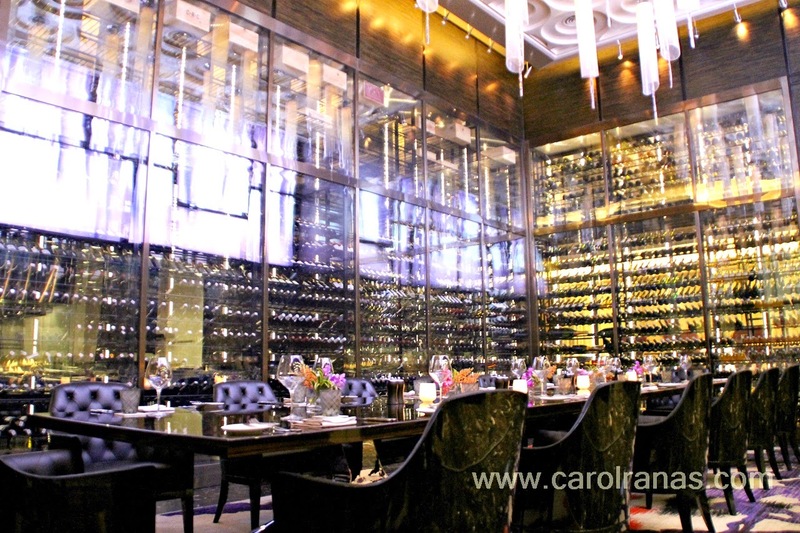 The interiors were posh just like all the restaurants in Solaire but each having distinct designs which amply adapts to the type of cuisine they offer. 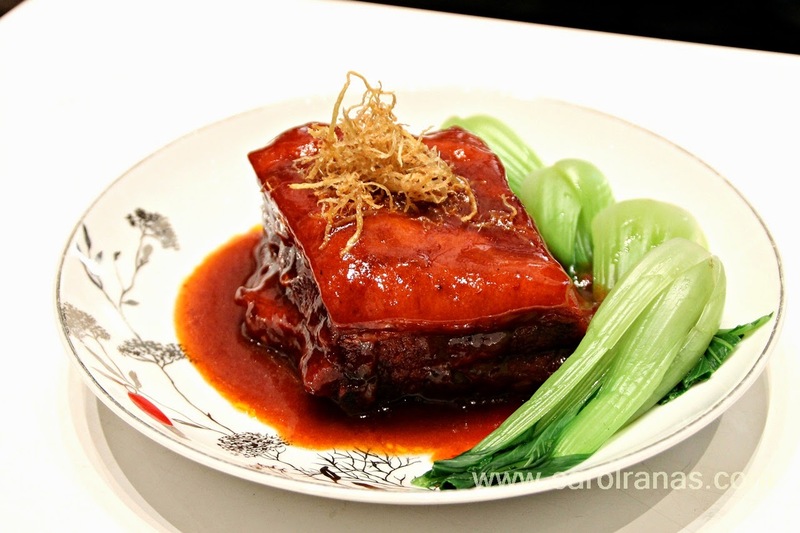 We were able to try their Wuxi Braised Ribs, which is also included in Solaire's Anniversary special offer. Their braised beef was juicy and super tender. 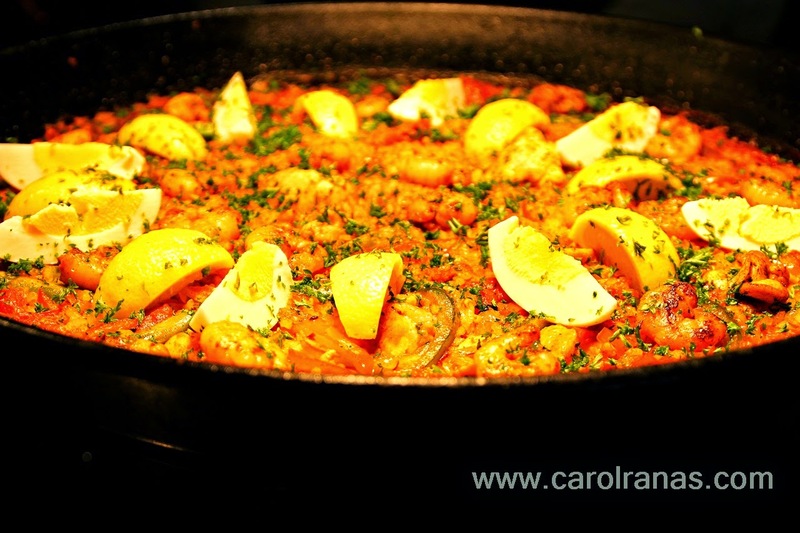 It has the right mix of flavors which was not overpowering. I've tried braised beef in other chinese restaurants and mostly, I find their flavors too overpowering. The Wuxi Braised Beef at Red Lantern taste light but definitely filling. 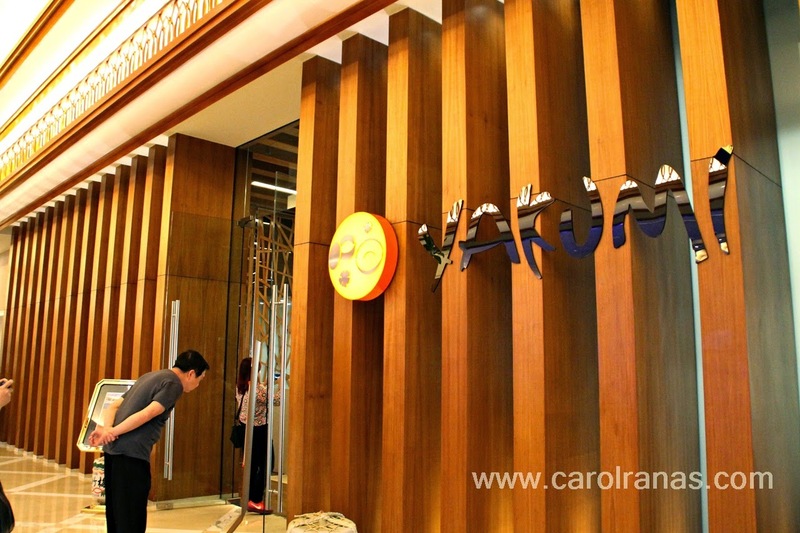 Yakumi is the first restaurant that will greet you once you are inside Solaire. Yakumi offers Japanese cuisine. 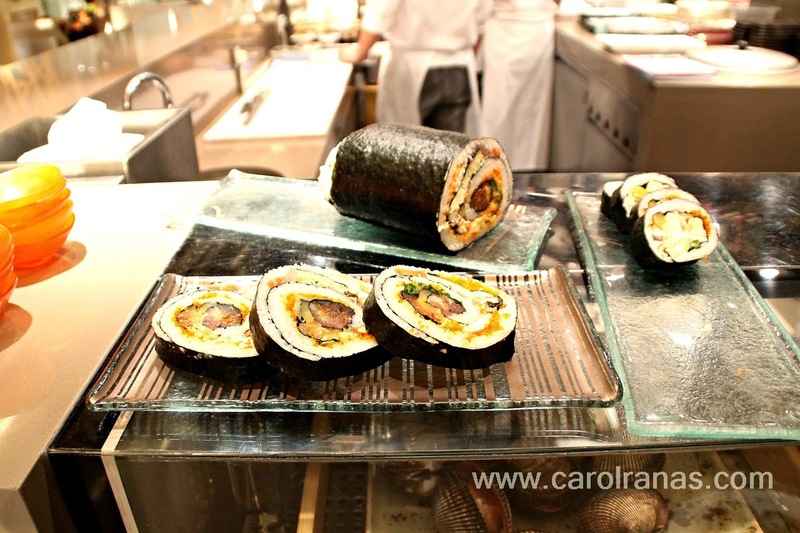 We were able to try their Ehou Maki, which is included in Solaire's Anniversary promo. 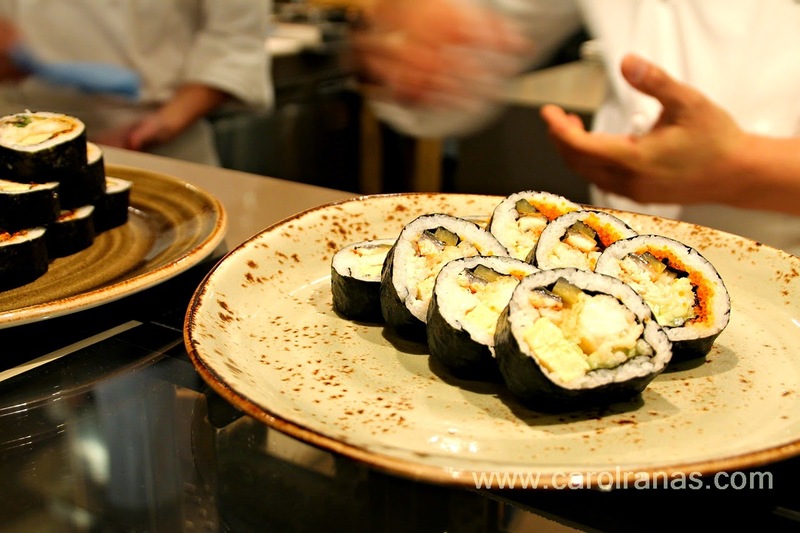 Ehou Maki consists of 6-7 different types of ingredients rolled inside the layer of Japanese rice and Nori sheets. They are served as long rolls that are slices to bite sizes. They also showed us their huge Ehou Maki, which almost a palm size in diameter. The chef even jokingly mentioned that one person can finish the huge Ehou Maki and challenged one of us to finish it. 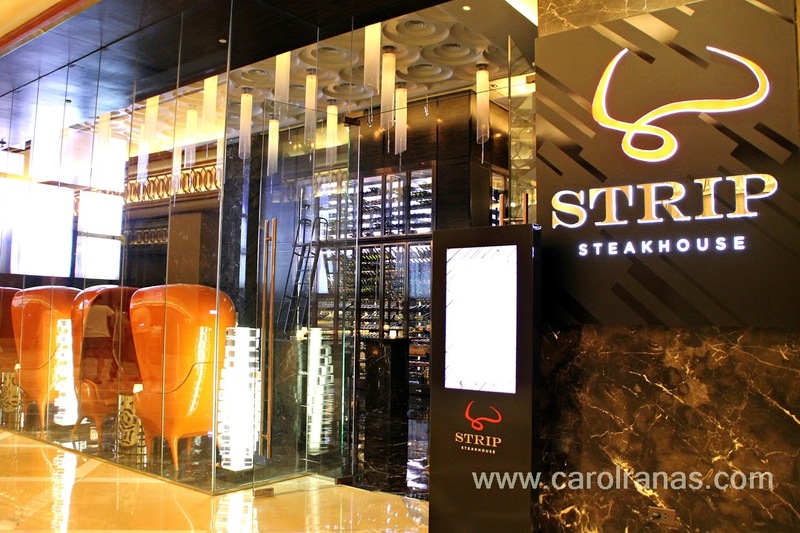 As its name implies, The Strip Steakhouse offers high quality steaks which are sourced internationally. Aside from steaks, Strip Steakhouse boasts of a fine selection of wines which goes well with all of their dishes. 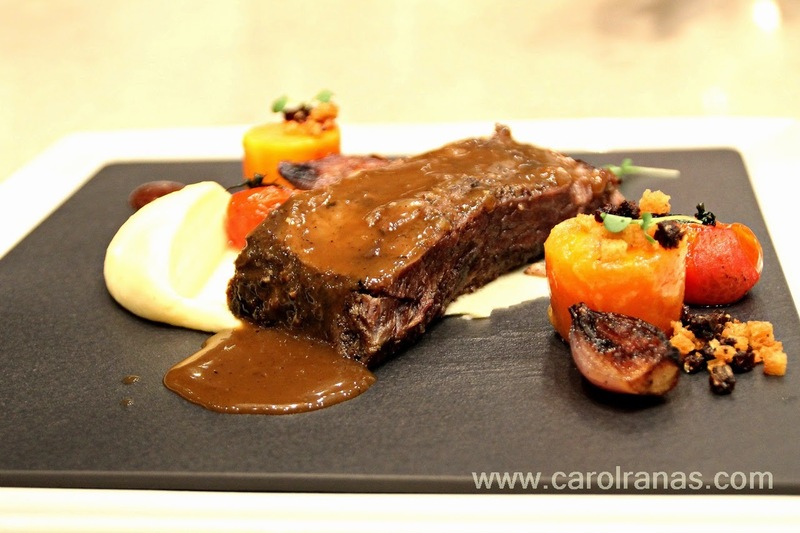 For Solaire's Anniversary promo, we were able to try Strip Steakhouse's Pastrami-Spiced Black Angus Beef Short Ribs. The chef showed us how the ribs were marinated and cured with spices. And as soon as we took a bite of this masterpiece, it was heavenly! Overall, it was one hell of a gastronomical experience. Imagine tasting fine and exquisite cuisine from 6 different types of restaurants for one day, it seemed like I'm having my last supper and will be executed the next day. Solaire does handpicked all their restaurants to make sure that patrons will be coming back for more. Every restaurant has a lot of items to offer, each with different unique dishes. Those are just six among all the restaurants inside Solaire. Solaire do know how to please their customers gastronomically. The dishes above are included in Solaire's Anniversary promo.  For more details about it, visit this link.